Good design endures. Today’s case in point: Vitsoe’s 606 Universal Shelving System. 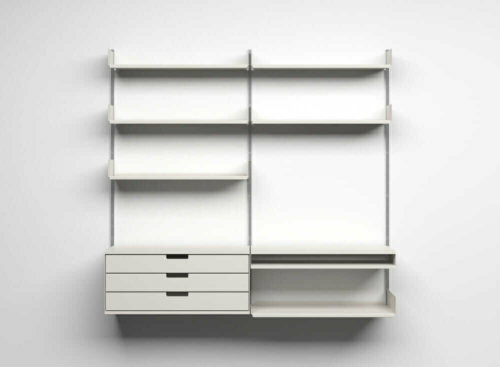 Designed in 1960 by Dieter Rams, this modular shelving system has been in production ever since. Isn’t it beautiful! 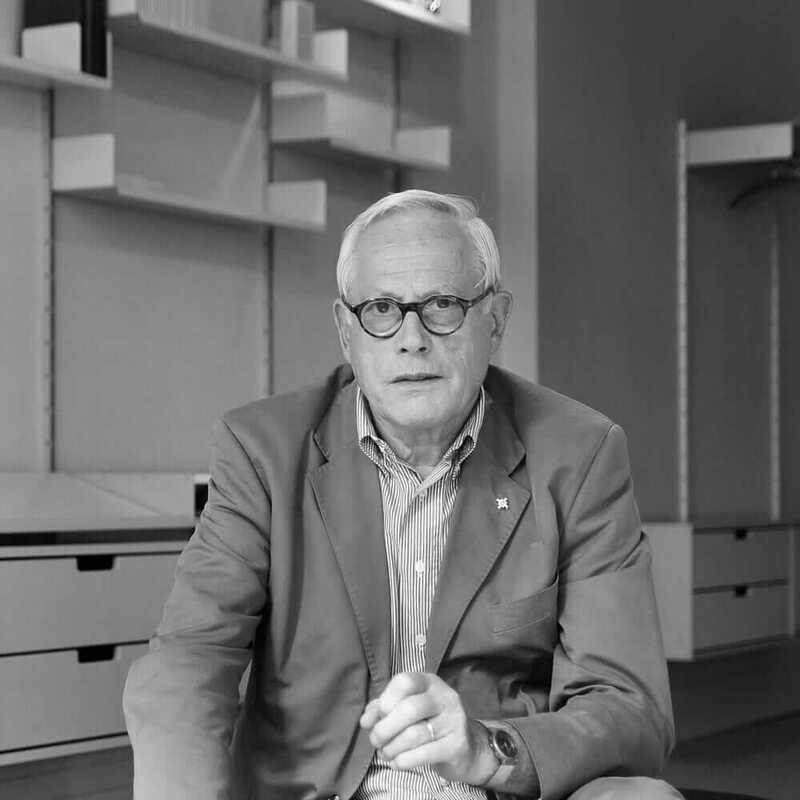 Photos courtesy Vitsoe. Photo of Ben Sander-designed den courtesy of Everett Short Photography. 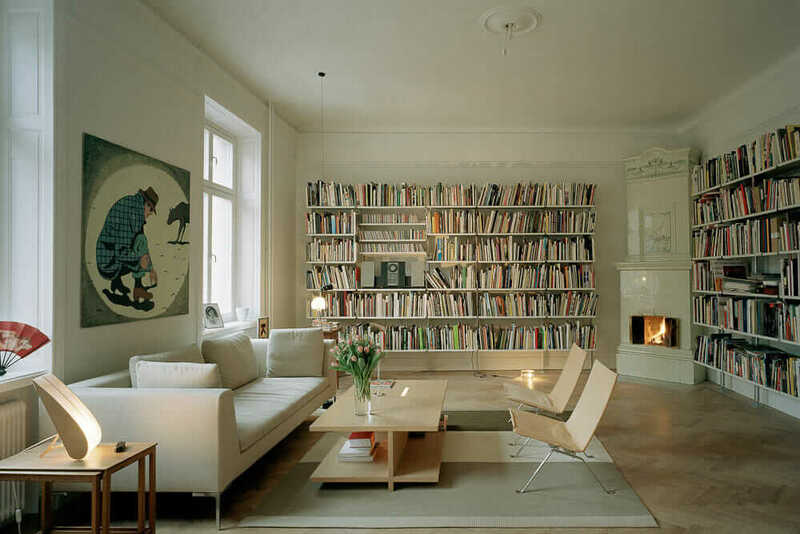 I originally saw this Vitsoe classic in the Bicentennial Chic den — shown above — created by Ben Sander. I guess all the red, white, and blue flummoxed me, because at the time, I kinda blew right by the Vitsoe unit. 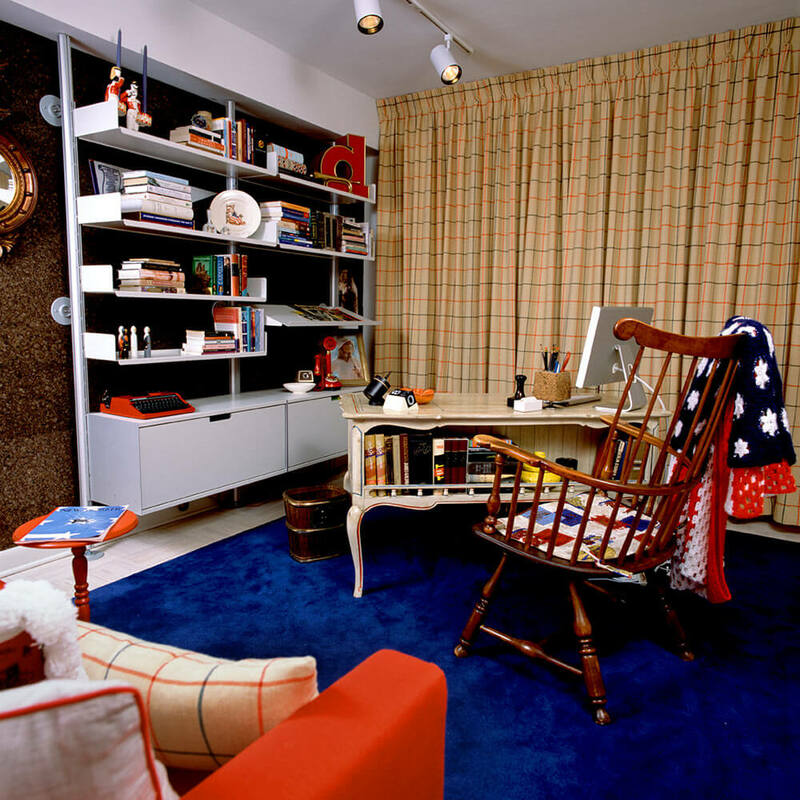 But I recently spotlighted Ben’s design on my homepage, and there was that Vitsoe again. Doesn’t it look fantastic: The way that Ben tucked it right under the bulkhead and then, set it against that dark cork tile wall … his mashup of ’60s sleek with carefully curated, super tidy ’70s kitsch — I spy: an oak bucket waste basket — the whole room is absolutely dreamy! Oh my. 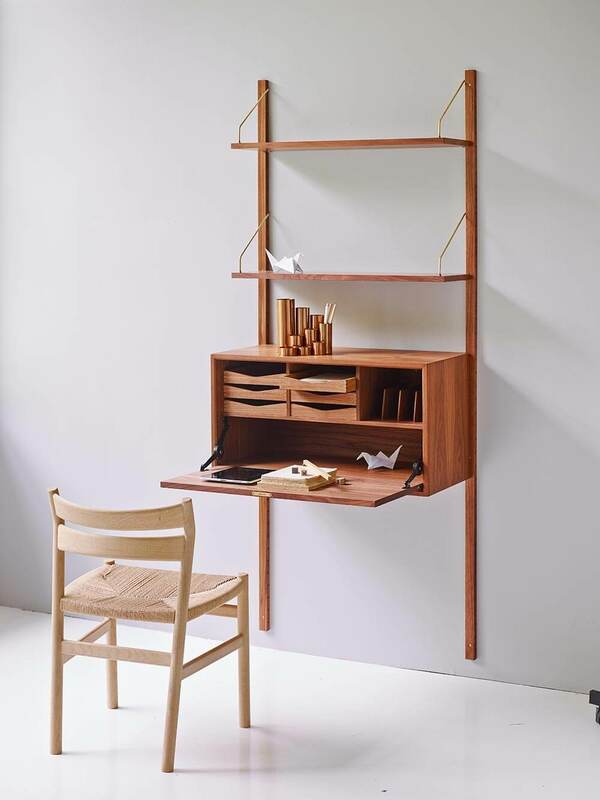 Why hadn’t I looked into and then written about that Vitseo before, especially since finding era-appropriate storage and shelving solutions is always of interest on the blog. So here we come: Vitsoe love fest 2018! Founded by Danish entrepreneur Niels Vitsoe in 1959, Vitsoe was launched specifically to bring Dieter Ram’s furniture design ideas to life. Free of ostentation, a small number of simple components allow easy assembly and rearrangement. At the core of the shelving system is the aluminum E-Track that is attached directly to the wall. Shelves, cabinets and tables are hung from the E-Track by slipping aluminum pins into place. If no wall is available the E-Track may be attached to an aluminum X-Post. The system can then stand on the floor and avoid obstructions allowing it to be installed in a wide variety of environments. The 606 Universal Shelving System was the company’s first product and remains, today, among three Rams-designed products in the company’s line. 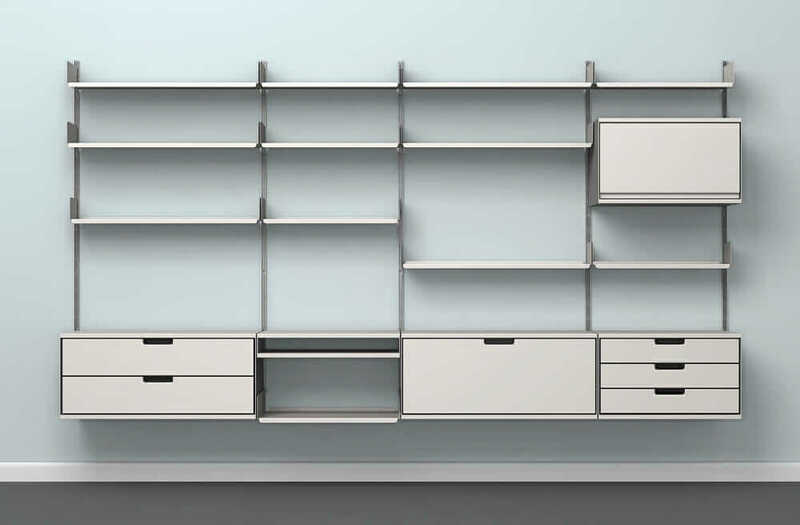 Now based in London, Vitsoe is also interesting in that they sell direct to the customer — there are no other retailers — so, you get 1:1 service straight from the company. 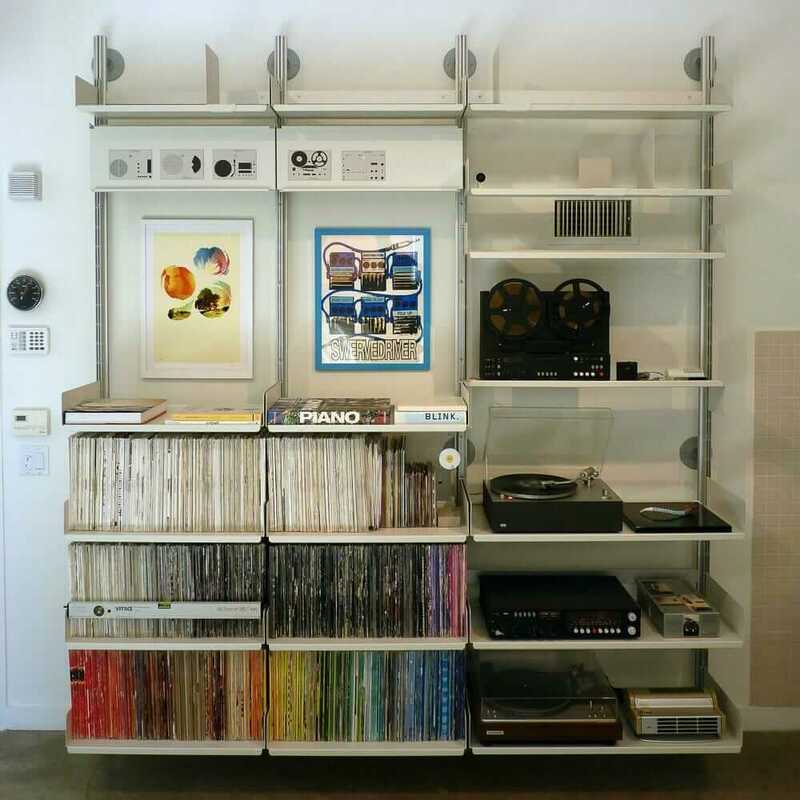 The shelving is not inexpensive. That said: A classic. An original. It’s meant to travel with you, when you move. And like the design itself, surely meant to last a lifetime, and beyond. 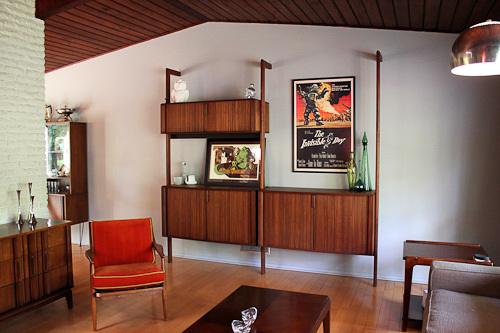 It seems strange to crow about how beautiful a shelving unit can be. But: Oh my, so beautiful! Open base cabinet shelving for my office craft room: Help! I have a component shelving and cabinet set made of wood with Colonial type curves. 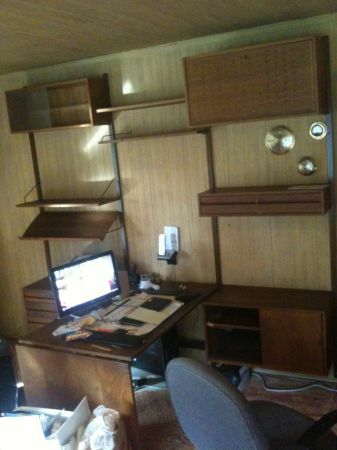 I got it from someone remodeling a 70’s era den. Everything is hung with L-shaped metal pegs from wooden rails that attach to the wall. 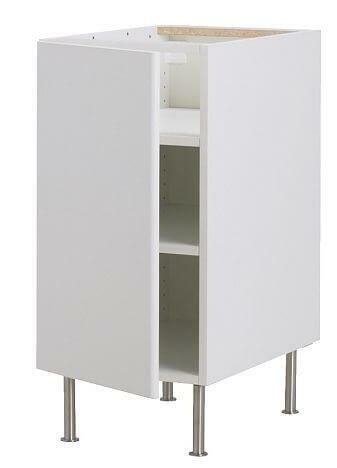 It includes straight and corner shelves, multiple cabinet sizes and a corner desk piece. I would love to find out more about it, I did not see any labels when we installed it so if someone knows please tell me.